Netting Installation Hardware is necessary for securing your sports nets in a professional manner in order for it to look nice and of course hold up. We carry the five basic, must have hardware tools for baseball, softball, golf, lacrosse, soccer & many more sports. 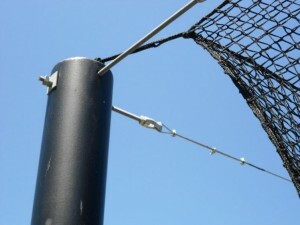 Nets of America carries netting installation hardware & accessories to fit your netting needs. Whether it is a baseball batting cage net, baseball backstop or any other sports netting job; we have you covered to make the install a breeze. The most common methods of attaching netting is through the use of clips, snaps, cables, turnbuckles and twine. Installing the hardware is not rocket science and it quite easy to do. It takes some time and help would be good. Keep in mind that there is no wrong way to install a batting cage or backstop net as long as it is held up firmly and does the job. Below are some basic steps to follow in order to make the install fast and effective. Netting Installation Hardware for batting cages or backstop netting installation begins with running the aircraft cable from pole to pole. Securing the cable to itself with cable clamps. After that is done, tension the cable with a turnbuckle. Add spring clips to the rope border of the net every 2 feet apart. Once done, bring the spring clip attached to the net up to the aircraft cable and hang it across just like you would with a shower curtain. You can then secure the vertical borders of the net to a pole or whatever the upright object is with twine every foot or so. You have now successfully attached your net using our hardware. Installation equipment should be chosen dependent upon your usage requirements and your installation designs. Contact us with any help on the quantity needed.